Yesterday, my mum and I went to watch a concert with a very famous Bollywood singer, Shaan. For those of you who don’t follow Bollywood, this means nothing, but just to fill you in, he is a big deal. He has one of those chocolate melting, soothing, melodious voices that elevate your mood. He is a smiler – and although it sounds strange – you can ‘hear’ that smile in his voice, there is so much joy when he sings. The concert was absolutely amazing. He sang pretty much non-stop for two and a half hours. I count myself fortunate to have seen this enormous talent, live. The day hadn’t started so wonderfully though. It had started with a phone call from my mum who was so busy, knew that I was also busy – and thought that perhaps we should not go to the concert in the evening after all. I was actually furious with her for even suggesting this on several counts, but my biggest problem was this – why was she putting errands and jobs and busy-ness above an experience that she’s never had before? No one would remember the one time her house wasn’t sparkling clean. No one would remember that she cooked 2 curries instead of the usual 4 or 5! No one remember the multitude of chores that she felt were incomplete. SHE, on the other hand, would always have a niggling regret in the back of her head that she had had tickets to go to see Shaan – but passed them over because of useless chores! I have heard, several times that people have said on their death beds – ‘I don’t regret the things that I did do in my life, I regret the things that I didn’t do.’ This is what inspired the bucket list. Things to do before you die. I don’t have a bucket list. I refuse to. I’m not really sure why – I suppose I don’t want the pressure of it. Perhaps also because I have no lofty ambitions of jumping out of a plane, or bungee jumping, or anything incredible. What I do want though – is to live – everyday. It’s impossible to do this at times. Chores and life takes over. Errands and work takes over. Practical life takes over. What I really wanted in life was to have a little family of my own. To be loved by someone who saw my flaws, but still loved me. To have children who would be fearless and confident enough to know that the world is theirs – go forward – achieve your dreams. This is what I’m determined to live everyday. It may sound boring to some of you. It may sound ambition-less to some of you. If I cared about what that anyone thought though, I’d be hiding under a rock. Last year, I turned 40. I know some people have melt-downs when they reach a new decade. Weirdly, I felt a sense of achievement. I felt a huge sense of gratitude. My dad had passed away when he was 33. He never had the chance to reach 40. I’m not embarrassed about ageing. I don’t really care about what anyone thinks of my age. It’s what I think that matters. But the real reason that I brought this up is because it was my birthday this week. I had a week off to celebrate. I was faced with a choice….enjoy the lovely family wedding on the Saturday, drive off on holiday few a few days, come back and concentrate on working…..OR, do those things, AND, enjoy the fact that my sister, my niece and my nephew are spending the week with us, spend quality time with them and take my mum to the concert and know that I will get my work done properly at another point. For the first time in my life – I chose life. Guilt-free. I chose life. I know I’ll get my work done – it too, is extremely important to me. But to go back to the original point about why I was angry with my mum – because up until now – I’d always done what she had done – put doing fun things off – with my family, with my friends – because I was bogged down with the practical things that needed to done – instead of living. Well, you can’t regret things that you have done – you can only regret what you haven’t done. My resolution is firstly to believe in myself – I have the ability and the time to do both – have fun and work hard. Secondly, to get my mum to work less and have more fun. But most importantly – I resolve to choose life. Every time. Choose to live. These precious moments of life – I’ll never get back. 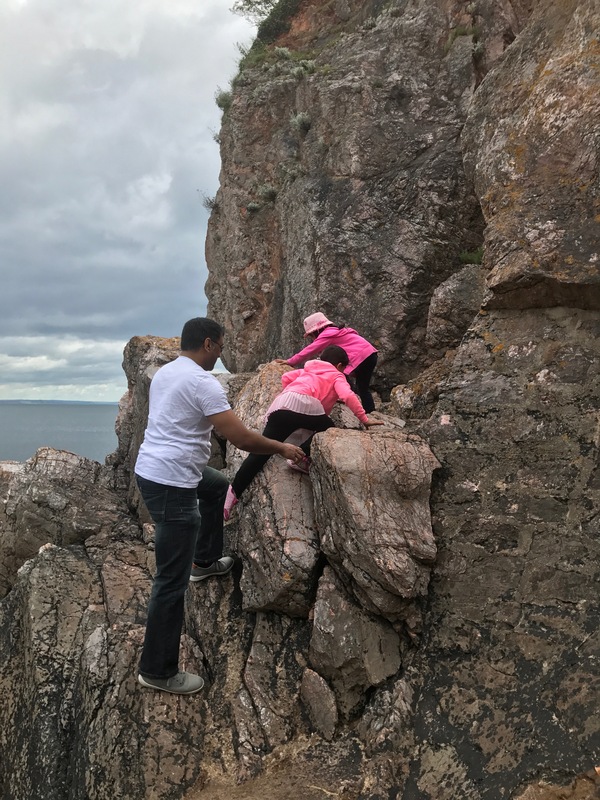 I’m going to post a picture of one of the proudest moments of my life so far…..we were on holiday in Devon, and we were walking by the sea, we saw some rocks…and my two little girls decided that we should climb the rocks…..and they were amazing. And although my heart was in my mouth and I was frightened – I wouldn’t have missed it for the world! And wouldn’t have stopped them from being fearless like this – ever. Work hard, do better, achieve more!